Setting clear and precise goals and objectives ensure that everyone is working towards the same goal, allowing for business and personal growth. Objectives clarify priorities and allow employees to allocate their time and resources more effectively. They also introduce a way of understanding how work will be measured and evaluated, thus enabling employees to evaluate their own performance, and make adjustments as necessary. This course aims to help you write effective objectives that deliver results. 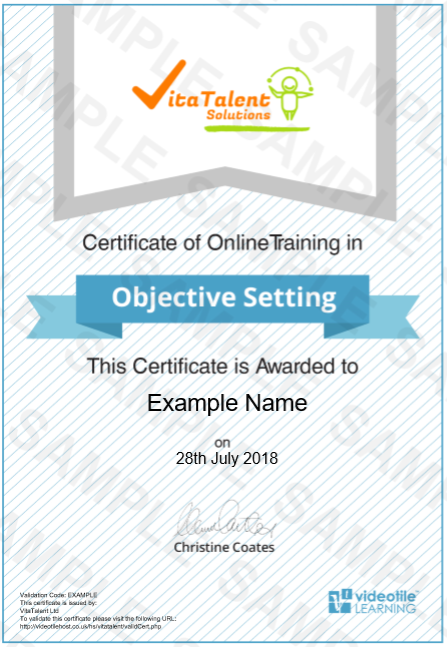 It covers the importance of goals and objectives and why we need them, the barriers to you achieving your objectives and how to overcome them, what SMART objectives are and how to write and identify them and concludes with some tips for successful objective setting. Instant certification on completion of all course modules and a test pass rate of 70%. Duration: 30 minutes (Note: This is based on the amount of video content shown and is rounded off. It does not account in any way for loading time or thinking time on the questions).